Generally, it is easier to identify a specific iPhone, or iPad than it is to identify a Mac although, many iDevices look quite similar to one another and some recent models, in particular, can be a challenge to differentiate visually. The most important is that if you want to find the perfect solution to recover lost data from your iPhone and Pad, you should identify the exact model of your device. Consequently, this page provides methods that can be used to distinguish a particular iPhone or iPad models. Note: iPhone 4 and iPhone 4S are both fully supported by Brorsoft iRefone for Mac, which is a full solution to recover deleted or lost data from iOS devices. While, you can recover 8 types Text Content and 6 types Media content from iPhone 4; for iPhone 4S, only 8 types Text Content are supported ifyou directly scan your iPhone 4S. Now see what's the differences between iPhone 4S and iPhone 4. Siri is an intelligent assistant that enables you to speak to send messages, make calls, set reminders, and more. It only appears on iPhone 4S and iPhone 5, if you have Siri, you have an iPhone 4S or iPhone 5. Check out if you have Siri on your iPhone first. Besides Siri, there are other differences between iPhone 4S and iPhone 4. As shown in the image below, you'll see the positions of black bars and the mute button are different. Apple has upgraded most hardware in iPhone 4S. Check the table below for the detail specifications of iPhone 4S and iPhone 4. There are also two types of iPhone depending on mobile phone standards: iPhone (GSM) and iPhone (CDMA). iSkysoft iPhone Data Recovery supports both iPhone (GSM) and iPhone (CDMA). This is the easiest way to distinguish iPad with Retina display (iPad 4) from iPad 2 and the new iPad (iPad 3). Check whether Siri is on your iPad, if it exists, it should be an iPad with Retina display, rather than iPad 2 or the new iPad. Since iPad mini and iPad with Retina display(iPad 4), Apple introduces a smaller connector and thus smaller port on iPad. If you're using a Lightning connector, your iPad is iPad 4, instead of iPad 2 or iPad 3. 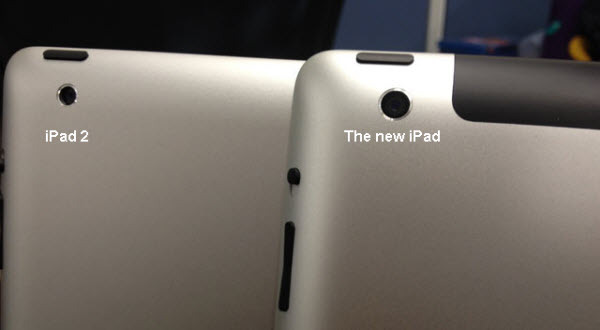 In the iPad family, iPad 2 and the new iPad is very hard to distinguish. Only very little changes are made between these two iPad models. Never mind, you can still find methods to distinguish them from each other. A huge improvement was made on the third generation of iPad. The lens is bigger and it has a wider angle and aperture. If you have a vernier caliper, use it to measure the camera diameter of iPad 2 (5.5mm) and the new iPad (6.9mm). If you have 2 different iPads on hand, judge it with your eyes. Voice Dictation, Siri's little sister, is an application to translate what you say into words. 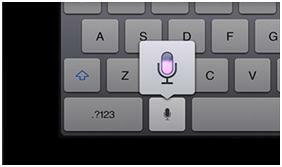 To distinguish the new iPad from iPad 2, simply check whether the Voice Dictation button is on the keyboard or not. If it's there, your iPad is the new iPad (iPad 3). They look exactly the same externally, so what separates these iPad minis? The processor is 1 GHz dual core ARM Cortex A9 in the 1st gen and 1.3 GHz dual-core Apple Cyclone in the later 2 generations. The graphics is supported by Dual-core PowerVR SGX543MP2 in the 1st generation mini whereas it upgrades to Quad-core PowerVR G6430 in the 2nd and 3rd generations. The 2nd and 3rd generation gets retina display whereas the 1st generation had the normal 1024*768 pixels. The operating system is iOS 8 in all three of them. The camera also is the same 1080p video recording, 5 MP, 30 fps with 5X digital zoom at the back and 1.2 MP in front. The battery gets a slight upgrade in the 2nd and 3rd generation. It goes from 4440 mAH to 6471 mAH. It is hoped that by having as many possible ways to identify iPhones and iPads available, you will have enough information to pinpoint exactly which device you have or intend to purchase. In wrong cases, such as iOS devices crash, accidentally delete information from your iPhone or iPad by touching the screen the wrong way etc., your data is gone... Don't despair. Brorsoft iRefone for Mac is an easy-to-use utility that enables you to quickly recover data stored on your iDevices. It can help you recover upto 14 types of lost files including Contacts, Messages, Call history, Calendar, Notes, Reminder, Safari bookmark, WhatsApp, etc from your iDevice. And it offers you 3 solutions to recover lost data from iPhone, iPad and iPod touch: recover lost files directly from your device connected; recover data from iTunes backup files; download and recover data from iCloud backup files. Its equivalent Windows version is Brorsoft iRefone.